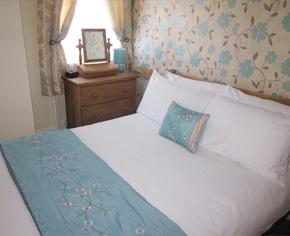 We have four tastefully styled rooms offering clean and comfortable accommodation and of course fully stocked with everything you'd expect to find. 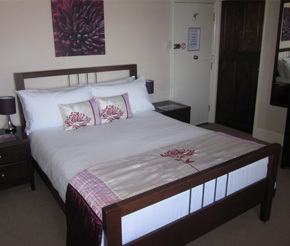 We have two double en-suite rooms, one standard twin and one standard single. Standard rooms have a bathroom adjacent to the rooms. 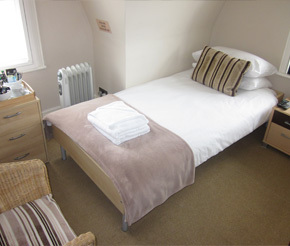 All rooms are equipped with wash-hand basins, flat screen TV with freesat, alarm clock, tea coffee, hot chocolate and luxury biscuits. Both doubles have iPhone/iPad docking stations. Room 7 has a fridge. Beds are dressed with crisp white linen and plump pillows, and white fluffy towels. We also have hairdryers, an iron and ironing board at your disposal. All rooms have complementary shampoo, conditioner and shower gel. Due to the age and character of our Guest House some features might make access difficult for people with limited mobility. Our guest rooms are situated on the second and third floor of the property and are accessed by means of stairs. Wake up to panoramic views after a comfortable night's sleep, followed by one of our famous breakfasts to start the day before you head off to see what Hastings has to offer.